Make any occasion special with this classic Western dish with a delightful local flavour. 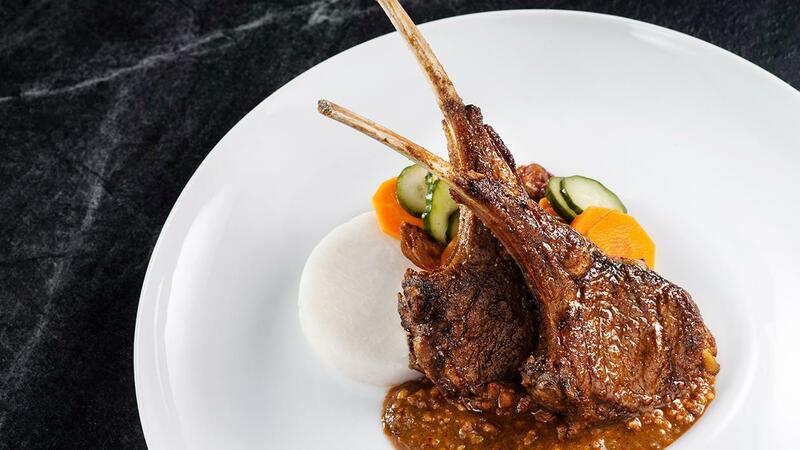 The tantalising sauce combining Knorr Rendang paste and peanut butter is bound to bring out the grilled lamb rack’s rich and robust flavour. Marinate Lamb Rack with Rendang Paste and fish sauce overnight. Grill Lamb rack for 6mins to medium well. Heat up sauce pot, add in oil, then stir fry lemongrass, onion, garlic, dried shrimp paste, coriander seed powder, cumin seed powder, galangal root powder and grounded peanut. Add dried tamarind with hot water, squeeze to dissolve pulp, strain. Add tamarind water to peanut mixture. Simmer at medium heat, add in chilli powder, sugar and salt. Stir till sauce thickens up. Fold in Peanut Butter and stir well. Pour peanut sauce on serving wares, add rice cake on it and grilled lamb rack over rice cake. Place achar on the side.